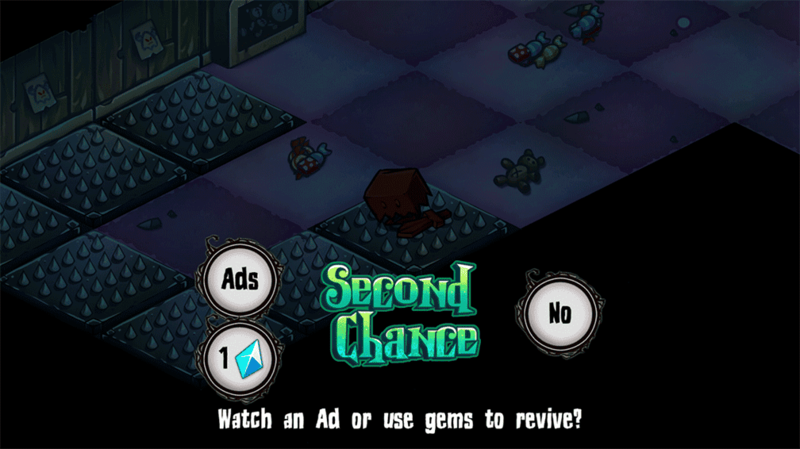 Advertising in games has proven to be a great source of revenue for game developers. 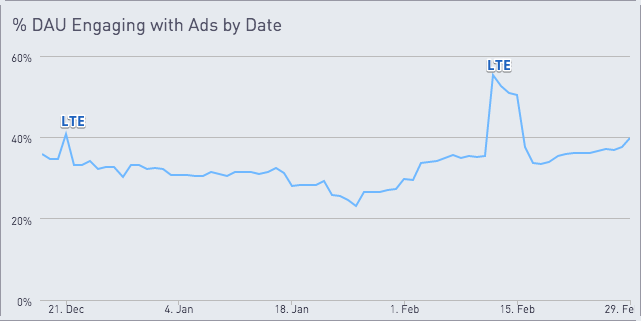 In many cases, ads increase the revenue baseline and provide the ability to monetize genres that historically hadn’t monetize before, such as endless runners and roguelikes. 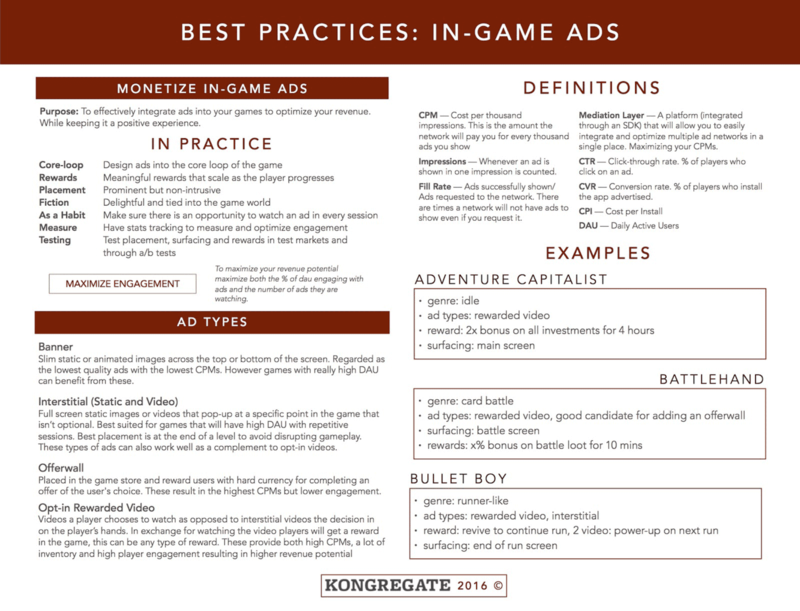 In preparation for Kongregate’s presentation at Casual Connect, we did a deep dive into the performance of ads in most of our titles. With only 20 minutes to present, we were only able to cover the highlights, which left out a lot of additional information and data worth sharing. These are “opt-in” video ads that a player chooses to watch. Unlike interstitial videos that automatically appear at predetermined locations and cadences, the decision to watch a rewarded video is in the player’s hands. In exchange for watching the video, players will get a reward in the game. This can be any type of reward. Today, rewarded videos are the most popular ad types, providing both high payouts (CPMs), a lot of inventory and high player engagement, all resulting in higher revenue potential. 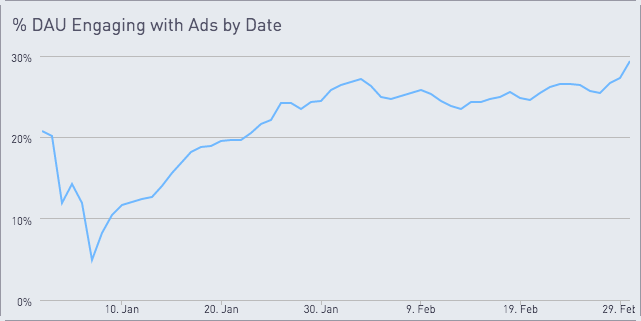 Surfacing: Is it easy for players to access the ads? Reward:Is the reward worth watching the 15-30 seconds of advertisement? Does the game give enough opportunities to watch multiple ads? If you answer yes to both then you should aim for at least 30% engagement rates with ~4 ads per day per player. What happens when KPIs are not looking that great? We ran into that situation with a roguelike game, Slashy Hero, during test markets last year. 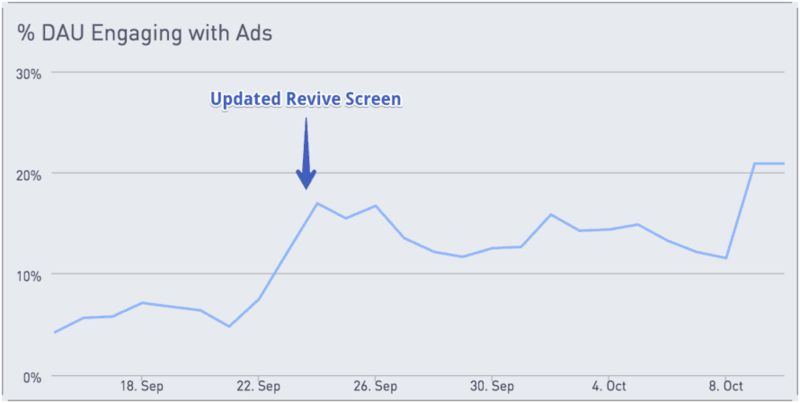 When we first launched the game we were seeing only 6.5% of DAU engaging with ads. Since we have multiple games to benchmark against, we knew something was wrong. With a game like this, where there are minimal IAP opportunities and most of the revenue is going to come from ads, it was extremely worrying to see this. Technical: There is something wrong with the code that triggers the ads. 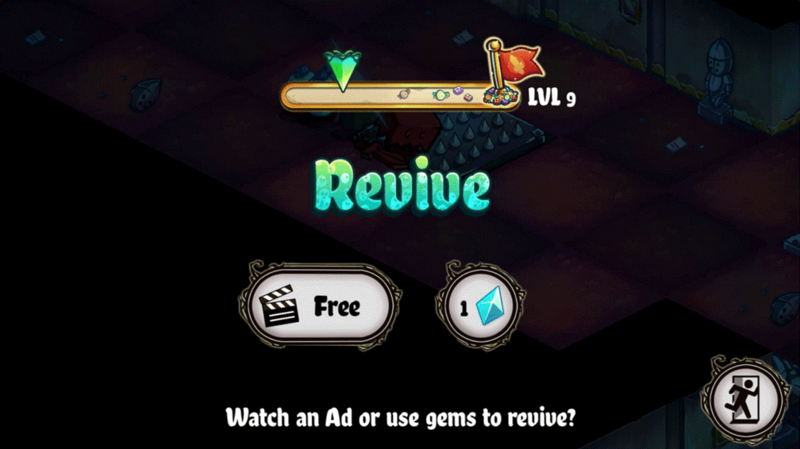 Surfacing: When we surface the ads during the revive screens it isn’t clear which button to press, which could result in a lower conversion on this screen. The goal, instead, is that the two revenue choices are highlighted while the "no" choice is clear, but not overly present. Following our own Best Practices we improved the surfacing right away. After doing this engagement rates jumped to 17%! Later on the engineers also found a technical issue; after fixing it we were able to reach the expected 35%-40% right before launch. This is exactly the goal of test markets (or limited geo release): to be able to find and fix key issues in the game. Is this exclusive to more Casual Games? No, we’ve seen great results in a couple of our mid-core titles, including our latest game Battlehand, a fantasy card battle RPG. Battlehand has a 25% participation rate, but that increases to over 35% as players age. Participating users watch about 5.5 ads per day. See that “Bonus Loot!” above Battle? Once tapped, it immediately shows a video. Once completed, a 10-minute timer starts and you get bonus loot for every battle fought in that time period. There is no clear description of the bump, but it’s akin to playing the level on a higher difficulty (slightly higher drop rates of the loot in the table). 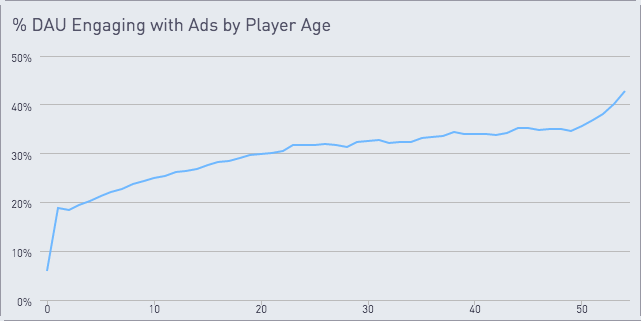 Players get more engaged with the ads the longer they play the game due to the value add. Can you quantify the revenue opportunity? This varies greatly based on the implementation, the game genre and current ARPDAU. That said, we’ve seen increases of anywhere from 10% to 40%. Quite the opposite. We’ve looked at this for a few different games and we see the same trend: when we break down engagement between payers and non-payers, payers engage with ads significantly more than non-payers. The key here is that for games with heavy IAP, make sure your reward is distinct and doesn’t compete with the items you are selling in the shop. Is this exclusive to Mobile Games? Not at all. Toward the end of last year we started bringing the same best practices to some of our web games and have seen great results. 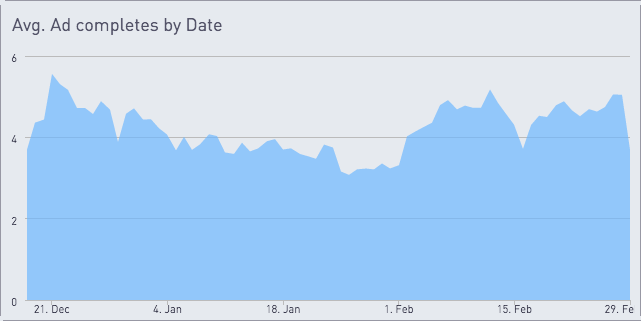 Take Realm Grinder, which has seen a 10% revenue increase after adding rewarded videos and sees very similar engagement stats to our mobile games. Realm Grinder has a 30% to 35% participation rate, but that increases to over 40% during Limited Time Events. Participating users watch about 4 ads per day. Casual, Mid-core, Mobile, Web, doesn’t matter. The same principles apply. For in-depth case studies for Epic Skater, Adventure Capitalist and Bullet Boy you can see our Casual Connect talk. Tammy Levy is the Director of Product for Mobile Games at Kongregate. 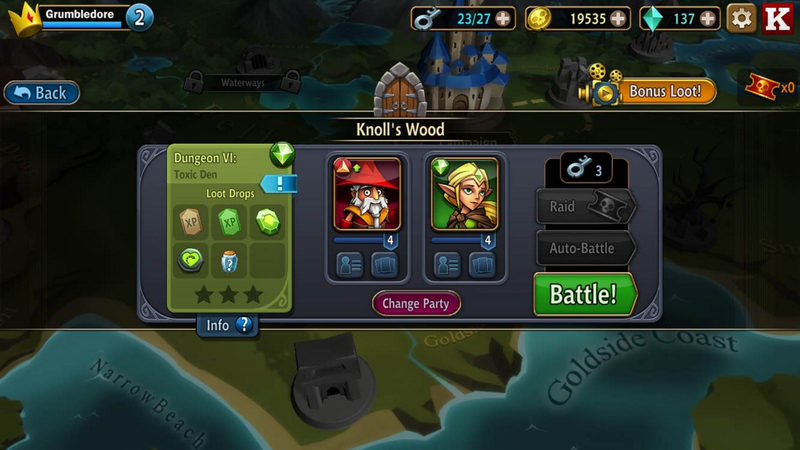 For more articles and data, be sure to check out Kongregate’s developer blog.